C1158. ALBERT COATES Cond.London S.O. : A Russian Festival, incl. Liadov, Moussorgsky, Rimsky-Korsakoff, Glinka & Borodin (incl. 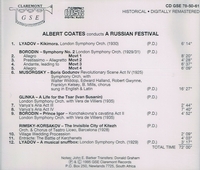 the latter's Symphony #2); Legend Of The Invisible City Of Kitezh - Excerpts, from Live Performance, 1928, issued only on Spanish HMV; Prince Igor - Excerpts, w.Vera de Villiers, from Private Recording, 21 Feb., 1935. (South Africa) Claremont GSECD 78-50-61, recorded 1925-31. Transfers by Graham Sound. Long out-of-print, final copy!